If you'd like to join us in producing this website or if you have any comments, we'd love to hear from you. Do you have photographs of Chechu, tales of your encounters with him, ideas / requests for a magazine feature, an opinion piece or any news items about Chechu Rubiera? Let us know. All enquiries, including requests for our free Newsletter, please EMAIL US. Or text to 00 44 (0)7751 596549. This photograph is perhaps the most important image on this website. In these moments, long before we knew each other, we each noticed Chechu Rubiera for the first time, and new fans were born. 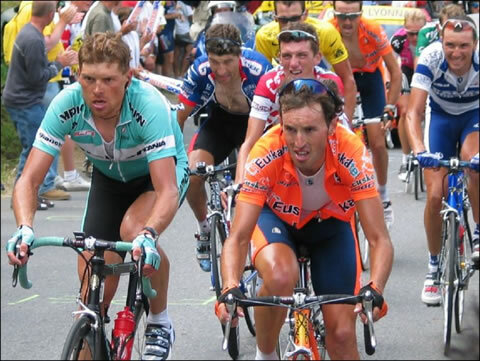 It was 21 July 2003, and on stage 15 of the Tour de France, Lance Armstrong fell on the final climb to Luz Ardiden. Chechu signalled to Armstrong, “It’s OK, calm yourself.”. He waited for his leader to take his wheel and pace him back to the lead group. And Lance won the stage. It was one of the most exciting sporting moments. Lance was unbelievable that day, but without Chechu Rubiera being there at the right moment to do his job, the final result might have been very different. www.chechurubiera.info is compiled by Rebecca Bell and Nicky Orr, with the agreement and support of Chechu Rubiera. Our aim is to produce a dynamic magazine to celebrate the achievements of Chechu Rubiera. www.chechurubiera.info is non-commercial. It is funded privately by Nicky Orr and Rebecca Bell. Responsibility for all content lies with Nicky Orr and Rebecca Bell, not with José Luis (Chechu) Rubiera Vigíl. Information and photographs is gathered and reproduced in good faith from published sources (online and print). Interviews and race diary quotes are reproduced with the kind permission of Chechu Rubiera. The editors’ decision is final. We always seek to credit photographs where possible. On occasion, the original source of photography may not be available. If we have used your photos, please EMAIL US and we’ll be pleased to credit your work. Privacy. We will never pass on your details to third parties. www.chechurubiera.info is a domain registered in UK to Nicola Orr.